How to care for potted flower "Women's happiness"
How to transplant flower "women's happiness"
Spathiphyllum, or "women's happiness" is a beautiful houseplant with bright green leaves on thin legs and the beautiful white flowers. To Spathiphyllum please you with its blossom, take care of proper care. Spathiphyllum is a marsh plant, so it loves bright sunlight. Make your bedroom a favorite of well-bloomed and grew, it requires the right lighting. Note that the flower should not grow in the shade, lack of light will cause the leaves to become pale. The plant can be placed successfully on the nightstand, South-West or South-East windowsill. Winter Spathiphyllum need to dosvechivat fluorescent lamps. The optimum temperature for this flower – 18-25C. Take care of Spathiphyllum from drafts. Special problems in the care of Spathiphyllum no, despite the apparent complexity. Regularly water the plant warm, soft and separated by water. "Women's happiness" loves humidity, the need for watering can be determined by the leaves that begin to fall. 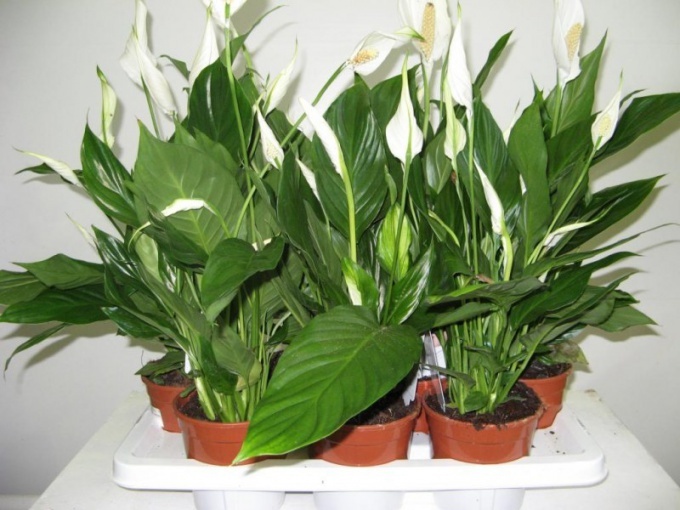 In the summer it is recommended to water a Spathiphyllum in a day, in the winter enough to do it twice a week. You can make the glaze not only from above but also using a deep pan to give roots the right amount of moisture. Daily spray the flower with water at room temperature from a spray. Wipe the leaves with a damp cloth or sponge. Flower "Women's happiness" - should be fed at least once per month. During flowering it is done often – once in ten or fourteen days. This will perfectly fit any mineral supplements or special fertilizer for flowering plants, which are sold in the store for floriculture. Houseplant "Women's happiness" necessary for the growth to transplant to a larger pot. Note that the pot you should pick up one or two centimeters in diameter more than the previous dishes. Too large a pot of Spathiphyllum bloom will be bad. It is best to repot plants in the spring to prepare a special soil mixture of two parts sod land, one part humus, one part peat and one part sand. Reproduces "Women's happiness" by dividing the Bush in the period of the transplanting of a flower. If the room is a green pet with the promising title bloom well and growing strongly is a good sign that justifies all the hopes and superstitions. Happiness you are not spared. And if so, you should share some of Spathiphyllum with others. Give them the opportunity to believe in the miraculous and magical power plants.